Congratulations to Kabir Chattopadhyay who is the first recipient of the Pyle Postgraduate Bursary. The bursary is for a final-year PhD student in English and is supported by Sheelagh O’Neill in memory of her grandfather William Fitzroy Pyle (1907-1989), who was a professor in the School of English. 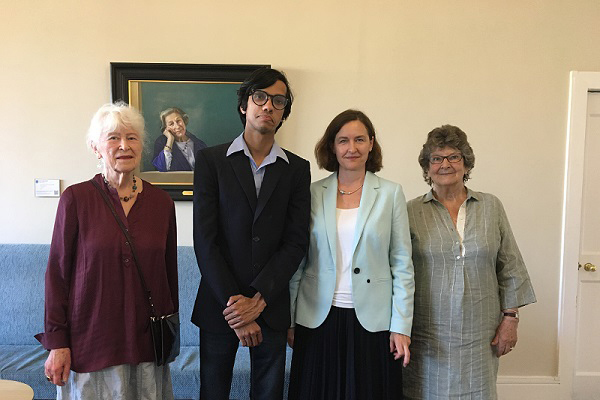 The photo shows (from the left), Hilary Pyle (Fitzroy Pyle’s daughter), Kabir Chattopadhyay, Sheelagh O’Neill (Fitzroy Pyle’s granddaughter) and Mary Pyle (Fitzroy Pyle’s daughter in law), at a reception to mark the award in the New Common Room TCD on the 29th May.